African states have received various forms of foreign aid throughout most of the postcolonial period. From the 1960s, when African states formulated and implemented various development plans, to the 1980s, when neoliberalism became the orthodox development thinking, African states have been inundated with various bilateral and multilateral supports. Foreign aid during each era have expectedly focused on helping Africa to converge or to implement recommended development policies and programs. During the era of national development planning, donors focused primarily on providing financial and technical assistance to enable African states to design and implement national development plans. Similarly, during the wave of market reforms and economic liberalization, the focus of most multilateral donors was to “assist” or force African states to implement neoliberal reforms. As African nations struggled with market reforms in the 1980s and 1990s, several multilateral donors introduced “conditionalities” attached to aid funds. In recent years, donors have focused on providing direct support to implement social programs, especially in the areas of basic education and public health. 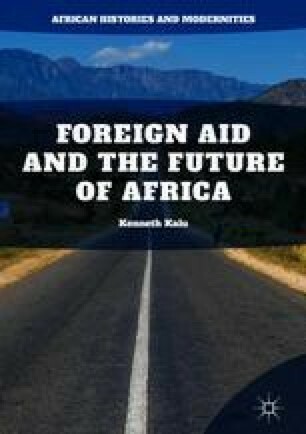 This chapter concludes that despite the various designs of foreign aid so far used by donors to assist African states, poverty has remained pervasive in the continent.